New projections warn of a much-more-congested future if immigration policies aren't changed. The Census Bureau's projections of where U.S. population size is headed are dire. But a new chart (see below) we have produced from the projections also contains a much brighter prospect if the country makes just moderate immigration reductions. This chart is the most recent update of many NumbersUSA has produced since 1996. The bottom line of all (which is the top line on the chart) is that if Congress doesn't reduce annual immigration, future Americans will be living congested lives that would be unrecognizable by Americans of the 20th century. THE TOP LINE on the chart is the latest projection from the U.S. Census Bureau of what is most likely to happen under current trends. The population in 2060 will be double what it was in 1970. That was in a period when a national consensus was forming that the country should move soon to stabilize the size of its population and certainly avoid adding another 100 million people -- let alone another 200 million which is what our new chart shows happening by 2060. THE GREEN ON THE CHART shows the U.S. population growth that would have happened since 1965 if there had been no immigration (SOURCE: Pew). 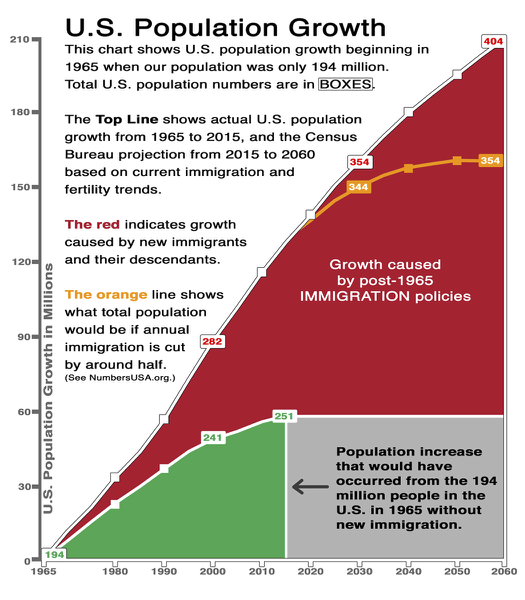 ALL THE OTHER POPULATION EXPANSION ON THE CHART (the red part) IS CAUSED BY CONGRESSIONAL IMMIGRATION POLICIES. Look at the red that rises above the green block from 1965 to 2018. That red mass illustrates the 75+ million additional people that Congress has forced into the country's cities, suburbs, former farms and natural habitat, its roads and schools through federal immigration policies since 1965. Can you think of anything that Congress has done that has had a larger impact on the country since 1965 than adding 75+ million through immigration? Now, look at the red tide that rises another 75+ million higher between 2018 and 2060. THE ORANGE LINE NEAR THE TOP OF THE CHART IS THE MOST IMPORTANT -- AND MOST HOPEFUL -- PART OF THE CHART. That is because it represents what is in our power as American citizens to achieve. If we can persuade Congress to make only moderate reductions in immigration, we can reduce the rise of U.S. population down to that orange line. You can see that the orange line levels off by 2050. LEVELS OFF! How great would that be for those of you young adults and your children -- and for the children and grandchildren of the rest of us. Instead of using immigration to force the addition of 75+ million more people to reach a total population of 404 million by 2060, the orange line shows a rise of 25+ million and a peak population of around 354 million. I don't have to remind you that adding yet another 25 million to the highways, byways and flyways of this country will make it much more difficult to maintain the quality of life that Americans desire. But dealing with 25+ million more people the next four decades will be incredibly easier than having to deal with the 75+ million that will be added if Congress doesn't immediately start reducing annual immigration! Every aspect of Americans' quality of life would be immensely better with 354 million than with 404 million. Even more important, the U.S. population would finally have stabilized by 2060, instead of continuing to balloon indefinitely into the future of our grandchildren's grandchildren. Massive amounts of natural habitat, farmland and other open space would be saved from the current relentless destruction in which immigration-driven population growth is the primary factor. The ORANGE LINE is based on what would happen if the annual level of recent green cards is reduced by around half. It has been calculated through work by Dr. Stephen Camarota, Director of Research at the Center for Immigration Studies, with assistance by Eric Ruark, Director of Research at NumbersUSA Education & Research Foundation. A cut of about half would bring annual immigration down to around what it was in the 1980s, which was already double the average in the 1950s and 1960s. The Orange line also assumes "zero-net illegal migration." That means the number of new illegal migrants moving into the U.S. each year is no more than the number of illegal migrants moving out of the U.S. each year. For this to happen, E-Verify would have to be mandatory for all employers and the entry-exit system would have to be fully implemented. In essence, the stabilizing future illustrated by the Orange line would be possible through the implementation of these long-time top goals of NumbersUSA: (1) end all chain migration of extended family, (2) end the visa lottery, (3) mandate E-Verify, (4) fully implement the entry-exit system, (4) end birthright citizenship. All of us must demand that candidates for Congress this fall declare whether they will continue the forced mass population expansion propelling us toward 404 million, or whether they will finally support moderate immigration reductions.